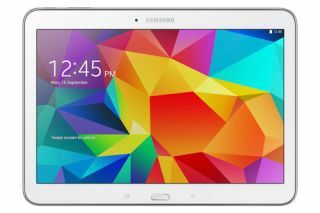 Samsung unveils next-generation Galaxy Tab4 tablet series | What Hi-Fi? With the UK launch of the Samsung Galaxy S5 smartphone imminent, the Korean manufacturer has announced details of its new range of next-generation tablets – the Galaxy Tab4. The new Tab4 series will be available worldwide this month in 10.1inches (above), 8in and 7in screen sizes – although UK availability and pricing are yet to be confirmed. All models have a WXGA display with 16:10 screen ratio, which Samsung claims will offer a "brilliant viewing experience while watching videos, playing games or reading digital contents". Features include Group Play, to share and play music and documents with friends; Samsung Link, to share content across devices; and WatchON, which allows you watch TV shows/movies. In terms of specs, all three sizes will run on the Android 4.4 KitKat operating system and offer a 1.2GHz quad core processor under the cover, as well as 3-megapixel and 1.3MP cameras. The 7in tablet (below) comes in wi-fi, 3G and wi-fi/3G/LTE models; the 8in version (above) will only come as an wi-fi/3G/LTE model and there will be wi-fi/3G and wi-fi/3G/LTE versions of the 10.1in. Samsung says UK availability and pricing will be available in "due course" and models are available in either black or white finishes.